Dieguito is missing his Papá Diego a lot. 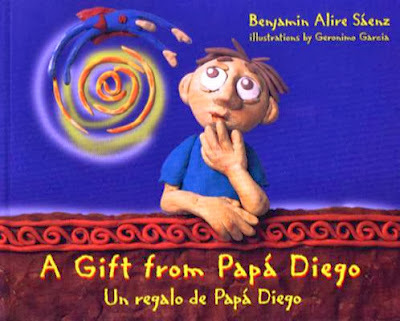 He wants to see his grandfather and he doesn’t understand the concept of far away—“if I could see my Papá Diego every day, …then every day would be as perfect as a sky full of summer clouds.” Dieguito’s father tells him that Mexico is far away, that it’s Papá Diego’s home and that he wouldn’t be happy in El Paso. When, for his birthday, Dieguito receives the Superman suit he had wanted, he finds that he is unable to fly to see his Papá Diego. Upset, he refuses dinner, including champurado, which, he is told, helps him speak Spanish and feel warm inside. When he finally comes down—to his surprise and joy—Papá Diego has arrived! García’s molded clay art, in muted, natural colors, is gorgeous; with brightly colored backgrounds that enhance, rather than obfuscate, the clay figures. Here is Dieguito, excitedly watching his mother in the kitchen, fixing chiles relleños. Here is Dieguito’s sister, taunting him. Here is Dieguito’s father, telling Dieguito the story of the day he was born. In this story, Mexico is about where Papá Diego’s home is, but El Paso is Dieguito’s immediate family’s home as well. When we think of borders, we generally think of physical lines, but the reality is that they are often political and economic borders that divide families. In reality, many, many children are taken from their parents and parents are taken from their children. Children—born here or there—feel the loss of their relatives on the other side, and fear the breakup of their families. We don’t know why part of Dieguito’s family members came to the US and some stayed in Mexico; it seems to have been an economic decision. We also don’t know whether or not the family has documents. Nevertheless, this story lends itself to a rich discussion of the migrant and immigrant experiences of separated families, and can be supplemented by other stories, such as Jorje Argueta’s beautiful Alfredito Flies Home. A Gift from Papá Diego / Un regalo de Papá Diego is highly recommended.